The following article originally appeared on Medium. We have reprinted it here in order to showcase the work of our alumni. Wakanda has caught almost the whole world’s attention from the moment it premiered in cinemas, and not just of the black world. The depiction of the fictional African nation ruled and protected by the Black Panther in the latest Marvel Studios superhero blockbuster has captivated audiences worldwide through its epic storyline, a strong cast of well-rounded and grounded characters, stunning action sequences and an unapologetic celebration of black and African cultures (and of black women especially). Probably most shocking to a majority (though admittedly too politically incorrect to say), has been the presentation of a recognizably African nation as the most technologically savvy and scientifically advanced in the world. But the surprise of Afro-futurism coming to the forefront is unwarranted: not only because the movement to mix African cultures and science-fiction has been ongoing for decades; but more importantly because the leadership in science and technology that Wakanda exudes, though original and new for Hollywood, is actually a reality now throughout Africa. In fact, one could argue that Wakanda isn’t science-fiction per se but rather science-anticipation, by only a few decades at that. Let’s start with the space industry, the least well-known African growth industry. Though the continent still lacks a Space X, African national space agencies and space exploration have known a rebirth in recent years, after growth spurts going as far back as the early 1960s. 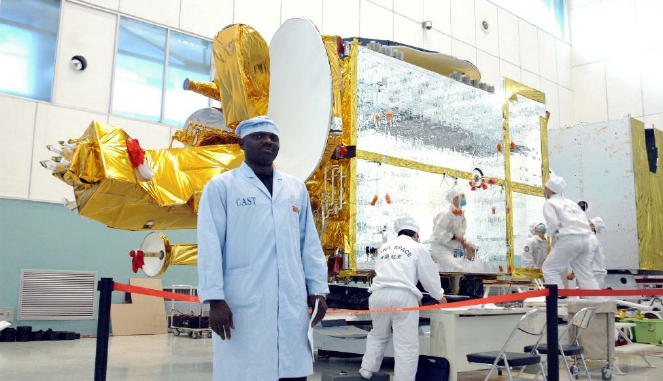 Nigeria’s NASDRA is mapping the Niger Delta’s oil and gas reserves and tracking Boko Haram terrorists with the NigComSat-1R, the continent’s first geosynchronous satellite, and four other satellites; while South Africa’s SANSA is leading the participation of several African countries in the international Square Kilometer Array project, the world’s biggest radio telescope, to explore deep space. 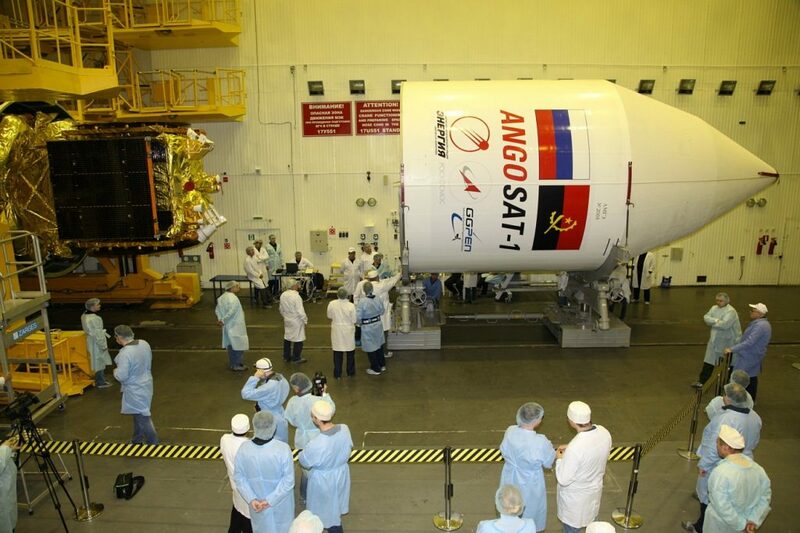 The NigComSat-1R was put in orbit by a Chinese launcher. The GhanaSat1, a 1U CubeSat mapping and monitoring Ghana’s coastline, was released from the International Space Station after a Space X trip dropped it by Angola’s AngoSat1 joined them in December 2017 when Russian authorities finally re-established contact with it after difficulties during its orbital launch. Ethiopia and Kenya are currently busy designing their own. Egypt, Algeria, Morocco and Libya are all operating satellites for both civilian and military purposes. This recent space industry dynamism has resulted in the African Union (AU) beginning the initial steps for an intercontinental African space agency, set to include one or several launchers. Cellphones on the other hand have become a famous example of technology leapfrogging on the continent. 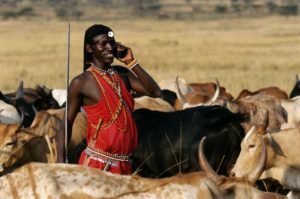 The strategic ramifications of this feat however are often overlooked: 1 billion African Base of the Pyramid (BOP) consumers with rising incomes are switching to smartphones and are set to become 2 billion by 2050. As the three trends of new technology acquisition, rising incomes and rising demography combine, the tail will increasingly wag the dog: the norms, trends and innovations from the BOP African consumers will increasingly become the norms and rule sets of the global market, including in developed markets. This is already becoming reality: a prominent example is M-Pesa, the mobile money platform created in, by and for Africans in Kenya, which then spread to South, East and Central Asia, Eastern Europe and Latin America and was the basis for Apple Pay and Amazon Pay. Growing beyond payments to include current accounts, savings, loans, investments and insurance, Africa emerged as the global leader in the full spectrum of mobile financial services (MFS): with half of the 282 mobile money services operating worldwide located on the continent and 100 million active mobile money accounts, used by 1 in 10 African adults; and annual revenues per active user of up to $29. 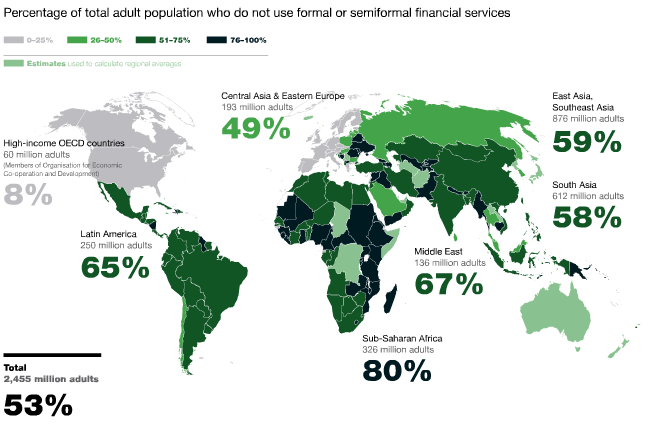 While South Asia, the world’s second biggest region, accounts for 40 million active accounts with 2.6% adult penetration. Commodities trading and pricing, especially in agro-commodities, is another industry that was transformed by African cellphone use, as African farmers became suddenly able to compare prices quite efficiently on a national and global basis and eliminate parasitic middle men. This is being compounded even further now by the advent of blockchain trading which is also transforming financial flows. More generally, the embrace of blockchain services in Africa is set to disrupt beyond those areas to reach functions such as tax collection and record keeping in land ownership, government data or health. Both a consequence and evidence of Africa’s increasing centrality to the global ICT market is the explosion of tech hubs on the continent to more than 300 active ones including Nigeria’s Yabacon Valley in Lagos, iHub in Kenya, the CTIC in Senegal, Outbox Hub in Uganda or Cameroon’s two IT Excellence centers. This centrality also explains why firms like Facebook, Google, Microsoft or Alibaba all have ongoing initiatives to grow their footprint on the continent. Drones for their part are a sector where many real-life versions of Shuri, T’Challa’s tech genius sister, are trailblazing. In 2016, Rwanda became the first country in the world to have a drone delivery system, composed of “cargo drones” making up to 150 deliveries of food and medical supplies per day, and set to go national. Zipline, the Silicon Valley company which partnered with Rwanda, expanded to neighboring Tanzania in 2018 to build the world’s largest drone delivery system: more than 100 drones at four drone distribution centers making up to 2,000 deliveries per day at 1,000 hospitals servicing more than 10 million people. What’s more, Rwanda is working on the world’s first “droneport” starting in 2020 and has set up a “performance-based regulations” policy to attract foreign investors to its drone sector. Rice University chose Rwanda as a partner in large part because its regulations made it faster to test, patent and competitively produce drones than in the US. In Cameroon, the Will and Brothers firm is locally designing and producing drones to be operated by its in-house Artificial Intelligence program, the Cyclop. The firm estimates its drones will be 25 times cheaper than current market prices. 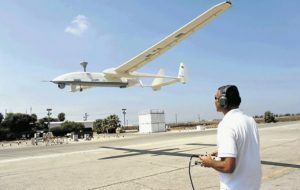 Nigeria already produces its own drones and others among whom Malawi, Kenya, Uganda and South Africa are setting up their own industries too. 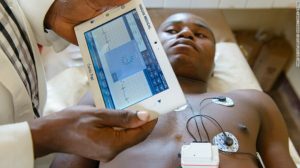 A special mention must be made of medical technologies, where in echo of Shuri’s exploits in “fixing white boys”, Africans are harnessing the convergence of different types of technologies: with products like the Cardiopad, a tablet combining the functions of the cardiograph, the radioscope and the blood pressure monitor, created by Arthur Zang from Cameroon and now produced in Cameroon and China and available at drastically cut prices; with programs like Rwanda’s cooperation with Rice University on lowering natal care costs, out of which was patented and produced locally solar-powered baby incubators which cut prices from $6000 to $400; or with institutions like Uganda’s Central Public Health Laboratories, the world’s leading center in research on Ebola and other pandemic threats, which has attracted hundreds of millions of US dollars for epidemiology research from the WHO and the US CDC, among others. A feat imitated by the Democratic Republic of Congo (DRC). This extends to biotechnology, where African countries are carving up a niche in agricultural biotech and spreading its benefits to the whole population. Simultaneously, dozens of biotech hubs are being set up in Ethiopia, Uganda, Kenya and others amongst which the fully functional, multimillion dollar, multi-disciplinary BioPark Mauritius where major European medical device companies producing 5% of all the catheters sold worldwide are already located. The aforementioned “cargo drones” in Rwanda and Tanzania will also be used during crises to transport emergency medical personnel or extract patients in critical condition to the right facilities. As a result of this convergence, Africa is pioneering telemedicine as a whole: Zambia, Kenya, the DRC, Tanzania and Nigeria among others are generalizing the use of digital health records, including now through blockchain technology. 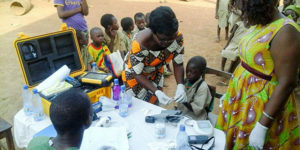 In response to the Ebola crisis, Liberia and Sierra Leone have both field tested the VGo, a robot which collects patient data in minutes and allows for two-way wireless communication with doctors in hospitals, and Clinipak, a portable, solar-powered, health records system capable of hosting its own Wi-Fi network. Smart fabrics, clothing enabled with nanotechnology to monitor the wearer’s vital health signs, are also fast emerging within African medical innovation. Since, in addition to appropriating these new fields, Africans also developing cheaper supply chains and introducing new products, expect to find African telemedicine and medical technology exported to a place near you in a developed market. All of the above explains how between 2000 and 2010, healthcare started contributing more to the continent’s growth than cellphones. Africa’s tech leadership, like Wakanda’s, also extends to greentech and renewable energy, which are set for cumulative growth of 70% by 2022. 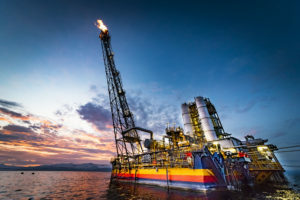 In May 2016, Rwanda began operating the $200 million KivuWatt, a floating gas plant and the world’s first industrial scale gas-to-power plant, designed to extract methane from Lake Kivu’s water to produce 26MW of power. 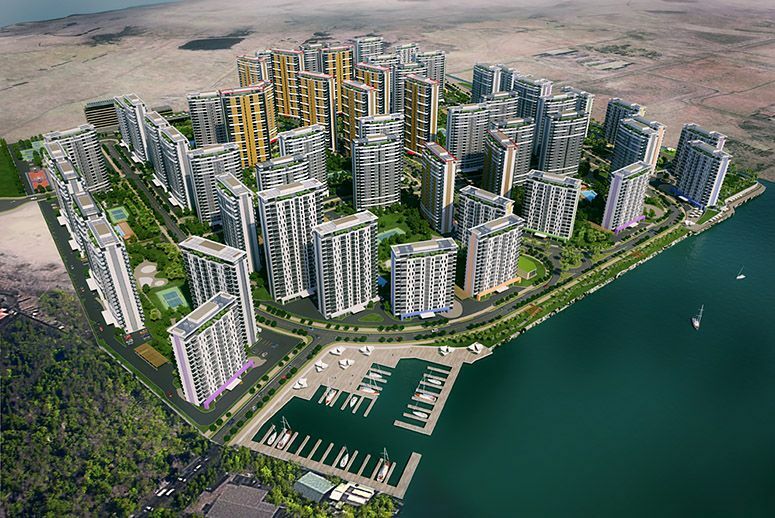 Phase 2 of the project will increase power output to 100MW. Harnessed by the right technology, Lake Kivu’s methane could produce up to 960MW, several multiples of Rwanda’s current total needs. In parallel, the Hilli Episeyo in Cameroon became the world’s second floating LNG (FLNG) plant in March 2018, with an annual output of 1.2 million tons and set to be replicated soon across Central and Western Africa. The 2.8MW generated by the Gorge Farm Energy Park in Kenya, the largest biomass power generation plant, are enough to cultivate 1740 acres, to power up to 6,000 homes and equal the annual production of 5 million liters of diesel fuel. The farm is also the continent’s first Anaerobic Digester (where micro-organisms break down organic material) and one of its by-products is 35,000 tons of natural fertilizer. It also sells electricity to the national grid at less than a third of the cost of diesel-generated power. Kenya’s biogas potential could reach up to 131MW of power and projections show that if just 1% of the country’s arable landmass were equipped for anaerobic digestion, it could produce 1,800MW, almost its entire current electricity output. Morocco’s 160MW Noor I project set to grow to 2,000MW over several phases and to export power to Europe and South Africa’s 175MW De Aar solar field offer models for how solar energy can evolve on the continent. Between these two poles, much smaller sub-Saharan solar parks are sprouting by the dozens, amongst which Rwanda’s 8.5MW Agahozo solar park, the 20MW Soroti solar park in Uganda or Senegal’s 20MW Senergy 2 project. The world’s largest solar hybrid power plant was inaugurated in Burkina Faso in March 2018 and its combined 72 MW output will power the Essakane gold mine while reducing annual fuel consumption and CO2 emissions. Kenya for its part has localized the full solar energy supply chain since 2011 with Solinc East Africa, its first photovoltaic products manufacturer, aiming to reach 5 million customers by 2018. In parallel, the multibillion dollar potential of the off-grid solar power market is attracting local entrepreneurs and international companies who are integrating mobile tech to produce innovative business models. Since South Africa produces more than 90% of the coal consumed in Africa and sits on 33 billion short tons of coal out of the continent’s 35 billion total recoverable reserves, its emergence as a hub for clean coal, carbon capture and storage technologies, through the FP7 initiative with the EU or through international joint-ventures, is a strategic asset for power consumption in Africa. But perhaps the biggest source of African power, renewable or otherwise, will turn out to be hydro-power, with tens of billions of dollars already flowing to fund dozens of hydro-power dams across West, Central, East and Southern Africa. 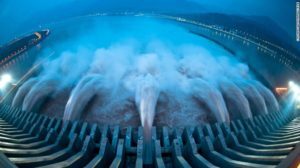 The big game changer here will be if and when the $100 billion Grand Inga hydropower project is completed: an engineering feat aimed at producing 42,000 MW from the Congo River, it would be equivalent to 20 nuclear power plants and enough for half the annual power consumption on the whole continent, DRC included. The DRC brings us to an even larger parallel between the fictional Wakanda and the real Africa: cobalt, a mineral essential for cellphone batteries, for those of self-driving cars and to operate AI systems. Two-thirds of the world’s cobalt is mined from only the DRC. Anyone else reminded of vibranium? Even more ominously, just as the DRC is re-asserting national control over the cobalt mining companies, it is in the throes of a charged battle for succession to its president and is facing drumbeats of conflict on its frontiers. Hmmm, is the plot of Black Panther really fiction…? The Next African Surprise Tech Leapfrog? When these different trends converge, another surprise tech leapfrog becomes apparent: Africa is successfully mastering IT in both software and hardware and already owns the minerals essential to its different product output. At the same time, automobile production on the continent is taking off with Ghana’s Kantanka line, Nigeria’s Innoson company, Uganda’s electric hybrid Kiira EV Smack or Cameroon’s upcoming Star of Africa line, while infrastructure rollout, particularly in highways and roads, is on an intercontinental upswing. As a result, Africa’s economies are in unique positions to leapfrog to driverless cars and other AI-enabled vehicles. As the driverless transformation unfolds, none should be surprised to find several African nations rivaling the US, China and Russia in this sector too. So how will the continent’s science and technology landscape evolve going forward? Will a “T’Challa” rise, an African Google or Jack Ma become dominant across the different national economies? Perhaps growing powerful enough to turn into a “Kilmonger,” competing against the Apples and Microsofts on their home turfs? Or maybe African innovation will emulate the traditional Wakandan wisdom of General Okoye, keeping each country strong enough to service the needs of its own market but wary from global entanglements. Of course, Africa’s tech scene could also ape Wakanda’s civil war, with W’kabis and M’bakus from different nations being set against each other by “colonizer” IBMs, Xiaomis, Sonys, Samsungs or Nokias.